Window Blind Lifts run on batteries and can be operated by a remote or by a wall switch. 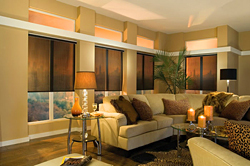 Motorized EcoGreen Window Shades are PVC-free, and contain no volatile organic compounds. The blind fabric is 100 percent recyclable.